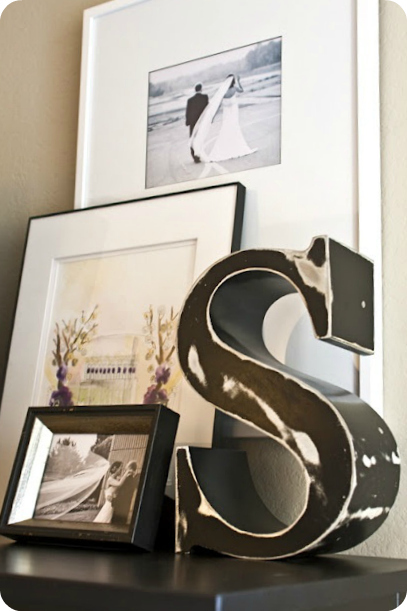 We've been getting a LOT of questions lately about personal photo display ideas in our inbox. 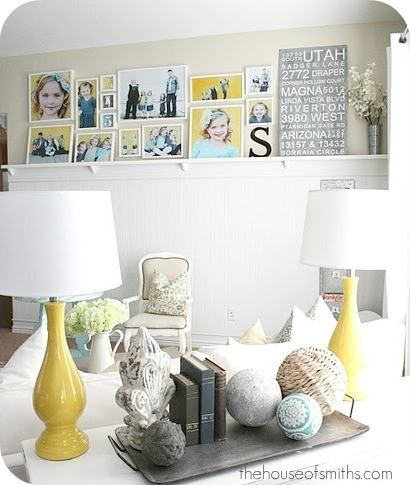 Maybe it's just a coincidence, or maybe we just have a bunch of readers who are starting in on decorating for Spring with all those new family pictures that got taken the past few months... either way, if you know me, then you know I LOVE decorating with personal photos. "How should I gather, group or display my photos so they look really good?" That's a great question, and something that isn't as hard as it seems. 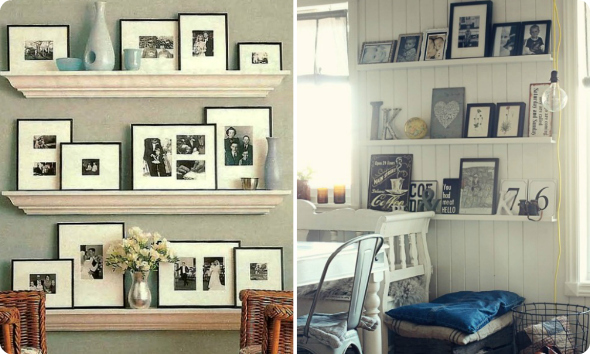 Below are a few awesome ways to show off your lovely family photos, with ideas on how to achieve aesthetically pleasing layouts at the same time, whether you have a large or small space. This look, to me, is timeless. 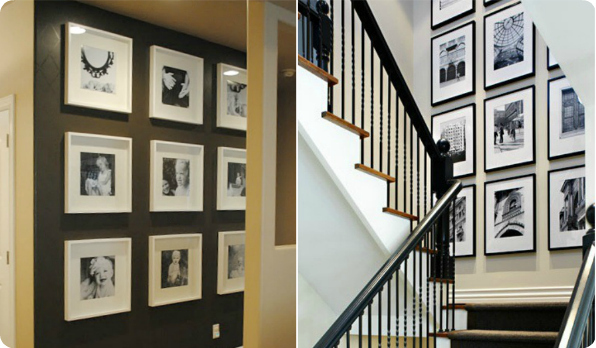 I love the evenly spaced frames, clean lines and drama that a symmetrical gallery wall gives off. I especially dig the floor to ceiling aspect as well. 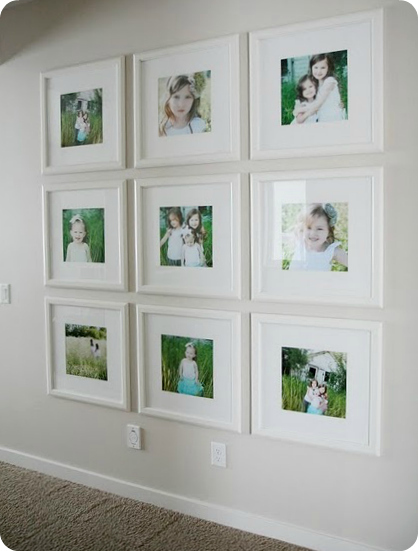 If you've got a large, empty wall to fill, this sort of photo display can definitely give your unoccupied space a ton of visual interest. 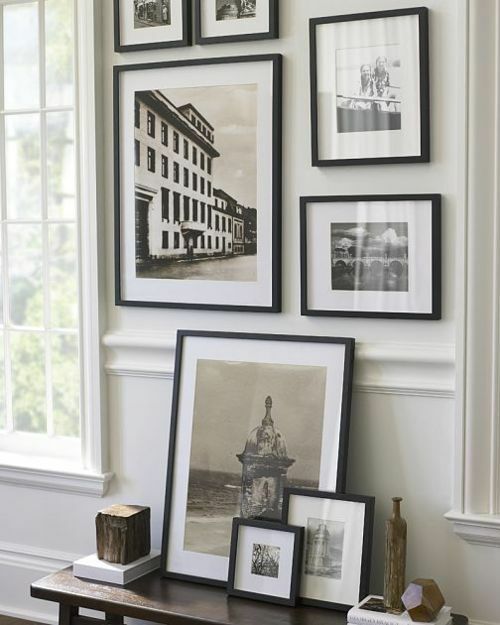 Planning a gallery wall, completely symmetrical or not, is probably the most time consuming type of photo display, only because you have to do a lot of measuring and planning to get it just right. One of the best tips that I can give here, is to make paper templates of your frames first. As you can see below (in this not-so-great photo, sorry!) 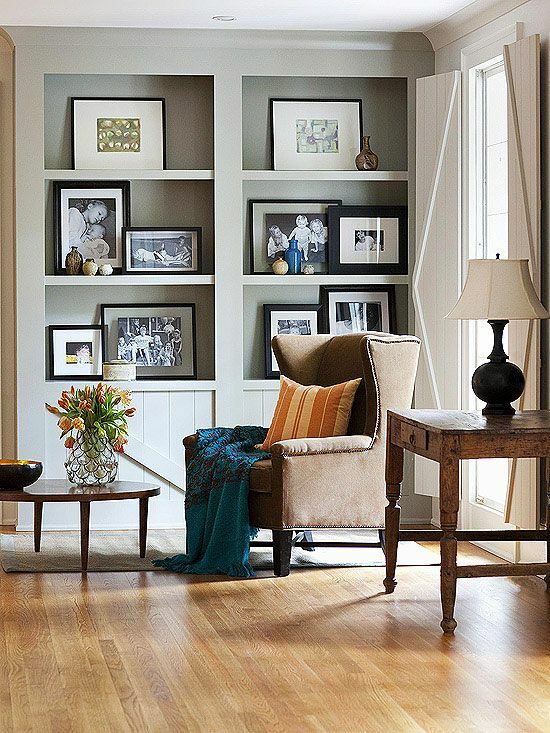 we used this method when we planned out our large gallery wall for our living room. This technique will make it effortless when it's time to work and rework things as you plan out your photo display. 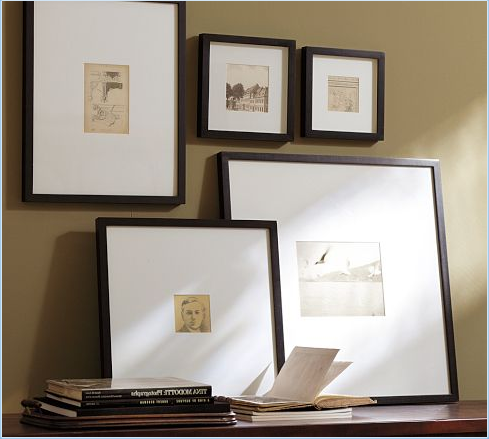 A Piece of paper is MUCH easier to move around than a heavy, glass-filled frame. - Size Variation is Key: Frames that are different shapes and sizes help to make your display look attractive and are perfect for layering. 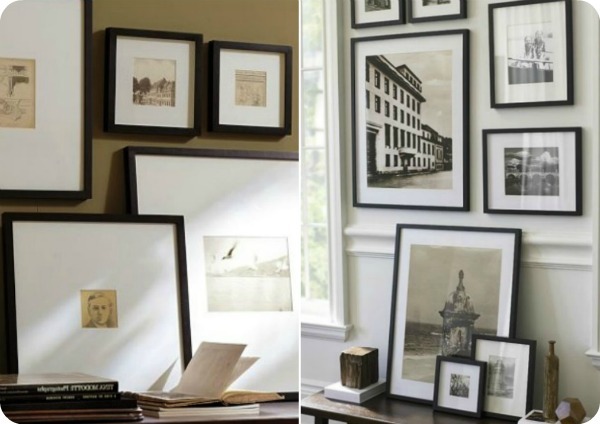 - Matting Widths: Lots of layered photo displays have frames with wider mattes. Not only does it create drama, but it gives you extra blank space to position frames in front of one another. I have yet to find a great spot in my home for one of these types of displays, but it's becoming a quick favorite of mine. 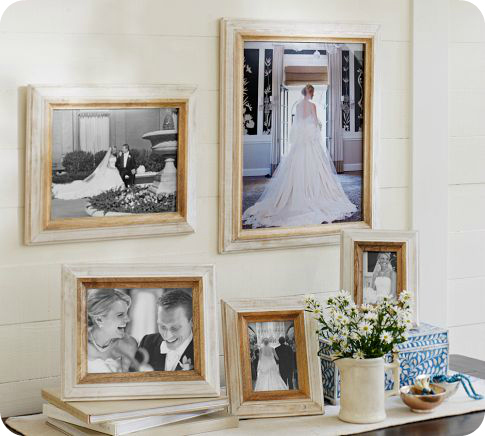 I love the illusion of framed photos starting on a wall and then spilling onto a table as well. I'd have to say that the cohesiveness of frame style, has to be the biggest part of achieving this look. I also have to add that even though pictures on shelves or walls are awesome, I LOVE having framed personal photos on tables too. They seem more interactive and welcoming to visitors. Photos on walls say: "Look, but don't touch"
Photos on tables say: "Pick me up! Study me and let me take you back to this moment"
eh... maybe the idea of talking photo displays makes me sound crazy, but I don't care. 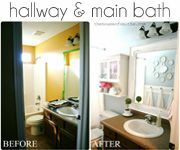 I've said it once and I'll say it again...I think that when you're unsure about a decorating process in your home, one of the best places to start is to see others examples. That's what blogs are for, right!? Once you've got a basic idea of how you want your space to look, you can then begin to personalize things with your own signature. 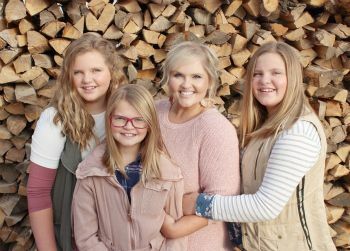 In my opinion, the best way for visitors to feel welcome in your home and with your family, is for them to experience a little bit of your life through photography. It's the perfect conversation starter. 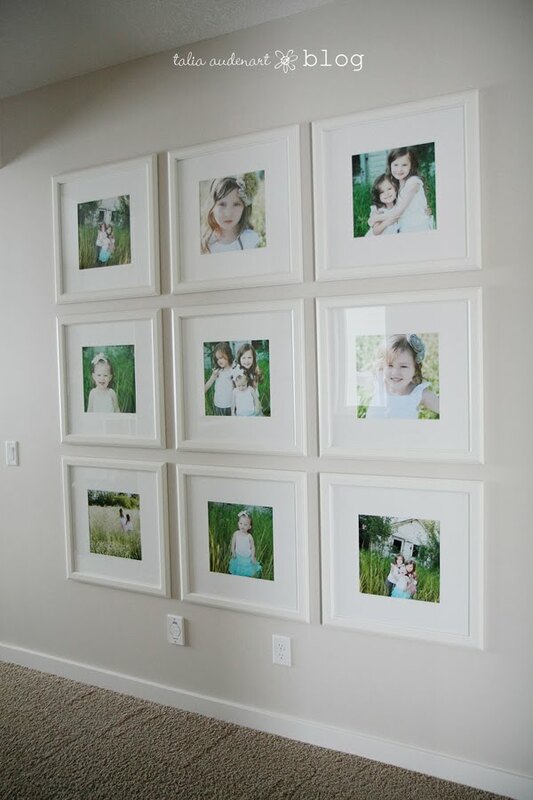 Displaying and sharing tasteful, beautiful moments through personal photos from your own life in your space, is the ultimate 'warm n' fuzzy hug' that your house can give to a guest. 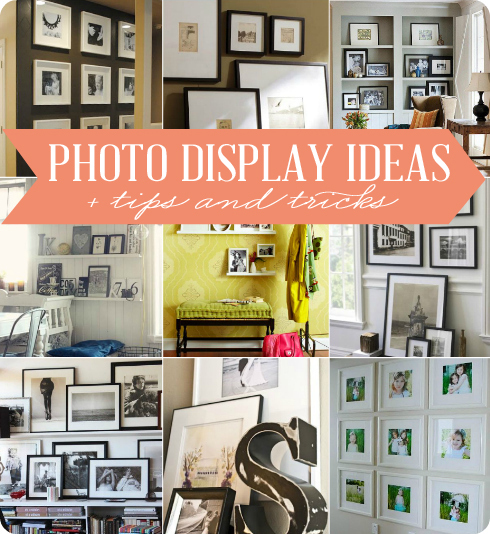 So use a few of these tips and try a little harder to make your photo displays interesting and lovely, all while still sharing those wonderfully captured moments. 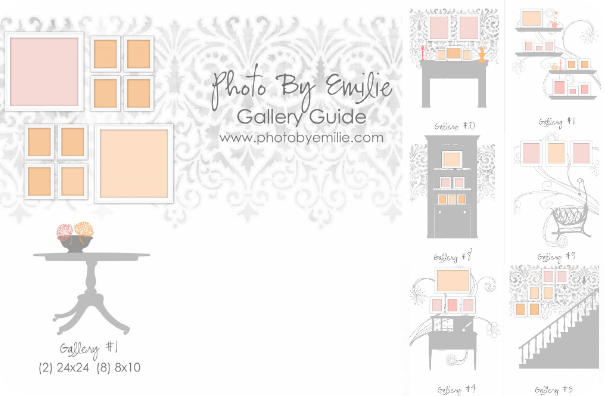 If you're still wanting further suggestions for how to display pictures in your space, Emilie from Photo by Emilie, has a really neat gallery guide post that she just created on her site. 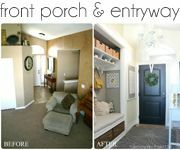 It shows suggestions for different areas in your home that you may want to display photos in, along with the corresponding photo dimensions that will be needed to go along with it. If you have a hard time getting super creative on your own, then this is an awesome option, because basically all the work is done for you! 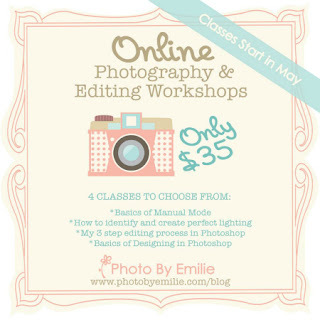 And if you're planning on taking your own pictures for your soon-to-be-awesome-photo-display, then check out her online photography and editing workshops for the month of May, as well. She's got everything from shooting in manual mode on a camera, to learning the in's and out's of Photoshop. As you know from previous posts, her classes have always been awesome for me. 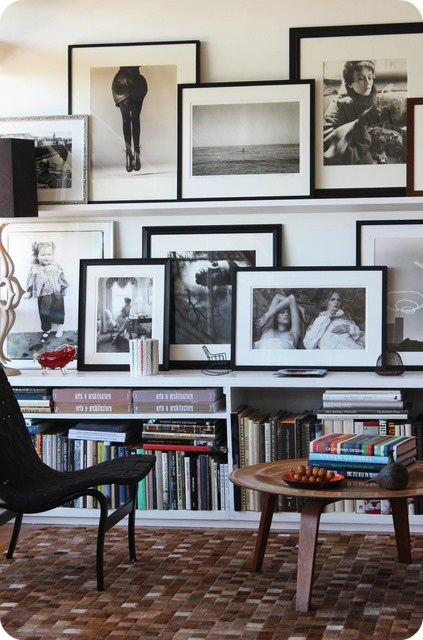 However you choose to display your personal photos... JUST DO IT! There's never been anyone that's taken the time to get their life's favorite moments up on a wall or table in a beautiful frame, and then turned around and said... "Yeah, no...I just don't like it." 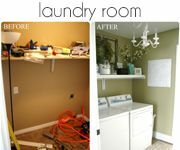 I have a huge wall with high ceilings and it is about to get a new look! As much as I have blogged about these myself, I am finally gonna do it myself! Love this post! Thanks! 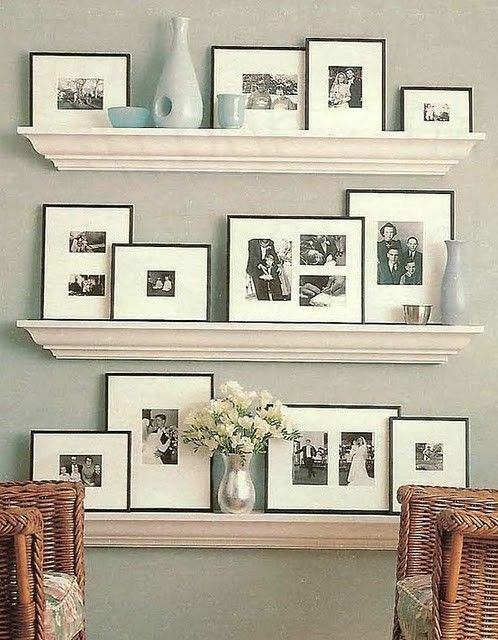 We have been dying to fill our walls, but had trouble deciding on ideas :) This was a perfect post to help us get moving and get those photos up on our walls! I love the frame layering and the paper templates, what an easy way to lay it out. Great post! Thanks so much for the ideas! I have so many pictures I'd love to use, but I'm always nervous about how to arrange them, so this is perfect. Hope you're having a great week! These are fantastic tips and I recently did a post on this topic as well. It really can make a break your room! 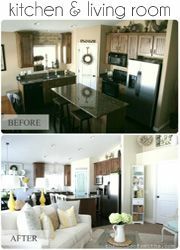 I also have an entire Pinterest board with additional ideas and inspirations! I love this post. I've been putting off doing a gallery wall for four years (yes, I said four), I'm been too scared that it won't look good but I think I'm ready with your encouragement. I'm just going to do it! While doing some genealogy I came across a bunch of old photos of my ancestors. One of these days I want to make a gallery wall with those photos to honor them and to celebrate my heritage. Thanks for the info. 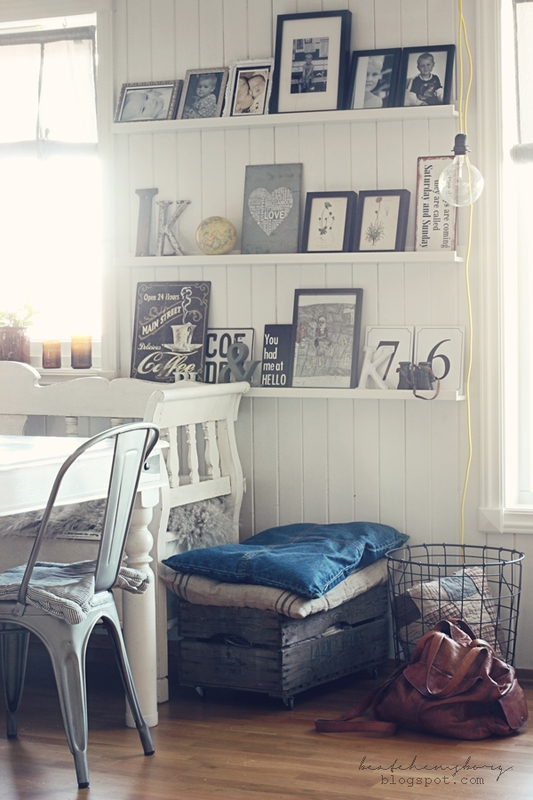 Perfect timing, Spring makes me want to change the décor in my house. I am ready to get some new photos hung up. :) Have a wonderful weekend. Great tips! The website Photo By Emilie won't allow me to see her site. Any chance you can let her know? Oh wow! We are so flattered that you featured our photo wall. It doesn't look like the source takes them to our site. Do you mind using this link instead? Thank you! 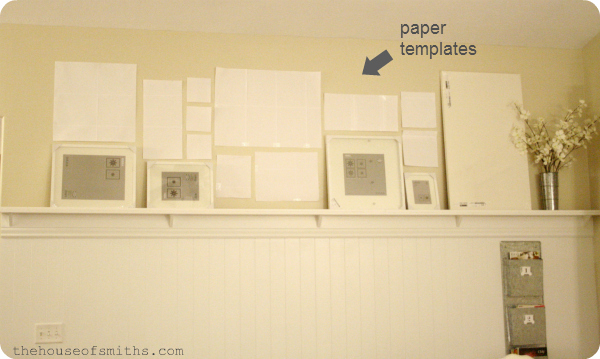 Wow, those are all so beautiful and love the paper template idea to give you a better visual idea of what it will look like.